Today, May 13 is the Feast of Our Lady as she appeared to three children at Fatima in Portugal in the year 1917. 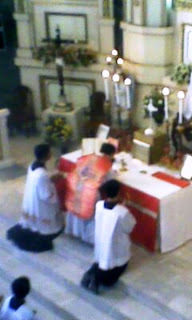 Devotees of the Blessed Virgin flocked to the Parish of Our Lord of Divine Mercy at 12noon to honoe her with a Traditional Mass of the Roman Rite. Since it is within the Octave of Pentecost, Mass of Pentecost Tuesday was observed with commemoration prayers to Our Lady. 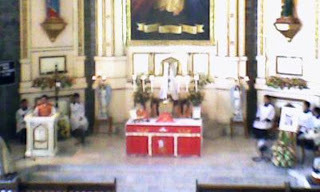 The image of the Pilgrim Virgin of Fatima of the Philippines was brought to the Parish for the occassion where she graced the sanctuary by being placed at the center of the altar. After the sung Mass, a short procession was held around the Parish's vicinity and was capped by hymns and flowers offerings and of course the Salve Regina as intoned by Fr. Jojo Zerrudo. 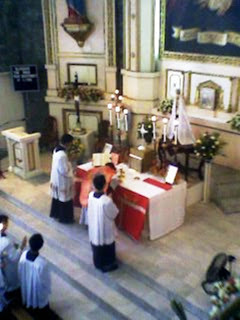 The Pilgrim image then was transported to the National Shrine of Our Lady of Fatima in Valenzuela, the only National Shrine within the Diocese of Malolos, where she graced the 6PM Principal Mass. 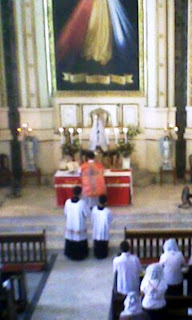 The next events will be the Feast of the Holy Trinity sung TLM and Corpus Christi with a Solemn High Mass. Our Lady of Fátima (pronounced [ˈfatimɐ]) is the title given to the Blessed Virgin Mary by those who believe that she appeared to three shepherd children at Fátima, Portugal on the 13th day of six consecutive months in 1917, starting on 13 May, the Fátima holiday. The three children were Lúcia dos Santos and siblings Francisco and Jacinta Marto. The title of Our Lady of the Rosary is also sometimes used in reference to the same apparition (although it was first used in 1208 for the reported apparition in the church of Prouille); because the children related that the Lady in the apparition specifically identified Herself as "the Lady of the Rosary." It is also common to see a combination of these titles, i.e., Our Lady of the Rosary of Fátima (Portuguese: ''Nossa Senhora do Rosário de Fátima''). A photostatic copy of a page from Ilustração Portugueza, October 29, 1917, showing the crowd looking at the miracle of the sun during the Fátima apparitions (attributed to the Virgin Mary)Lúcia described seeing the lady as "brighter than the sun, shedding rays of light clearer and stronger than a crystal glass filled with the most sparkling water and pierced by the burning rays of the sun." According to Lúcia's account, the lady confided to the children three secrets, known as the Three Secrets of Fátima. She exhorted the children to do penance and to make sacrifices to save sinners. The children wore tight cords around their waists to cause pain, abstained from drinking water on hot days, and performed other works of penance. Most important, Lúcia said that the lady asked them to say the Rosary every day, reiterating many times that the Rosary was the key to personal and world peace. Many young Portuguese men, including relatives of the visionaries, were then fighting in World War I. Thousands of people flocked to Fátima and Aljustrel in the ensuing months, drawn by reports of visions and miracles. On August 13, 1917, the provincial administrator and anticlerical Freemason, Artur Santos(no relation), believing that the events were politically disruptive, intercepted and jailed the children before they could reach the Cova da Iria that day. Prisoners held with them in the provincial jail later testified that the children, while upset, were consoled by the inmates, and then led the inmates in praying the Rosary. The administrator interrogated the children and unsuccessfully attempted to get them to divulge the content of the secrets. In the process, he tried to convince the children that he would boil them one by one in a pot of oil unless they confessed the secrets. The children, however, resisted. That month, instead of the usual apparition in the Cova da Iria on the 13th, the children reported that they saw the Lady on August 19 at nearby Valinhos. As early as July the Lady had promised a miracle for the final apparition, on October 13, so that all would believe. What transpired became known as "Miracle of the Sun". A crowd believed to be approximately 70,000 in number, including newspaper reporters and photographers, gathered at the Cova da Iria. The incessant rain had finally ceased and a thin layer of clouds cloaked the silver disc of the sun such that it could be looked upon without hurting one’s eyes. Lúcia called out to the crowd to look at the sun. Sometime while Lucia was pointing towards the sun and seeing various religious figures in the sky, the sun appeared to change colors and rotate, like a fire wheel. For some, the sun appeared to fall from the sky before retreating, for others, it zig-zagged. The phenomenon was witnessed by most in the crowd as well as people many miles away. Columnist Avelino de Almeida of O Século (Portugal's most influential newspaper, which was pro-government in policy and avowedly anti-clerical), reported the following "Before the astonished eyes of the crowd, whose aspect was biblical as they stood bare-headed, eagerly searching the sky, the sun trembled, made sudden incredible movements outside all cosmic laws - the sun 'danced' according to the typical expression of the people." Eye specialist Dr. Domingos Pinto Coelho, writing for the newspaper Ordem reported "The sun, at one moment surrounded with scarlet flame, at another aureoled in yellow and deep purple, seemed to be in an exceeding fast and whirling movement, at times appearing to be loosened from the sky and to be approaching the earth, strongly radiating heat". The special reporter for the October 17, 1917 edition of the Lisbon daily, O Dia, reported the following, "...the silver sun, enveloped in the same gauzy grey light, was seen to whirl and turn in the circle of broken clouds...The light turned a beautiful blue, as if it had come through the stained-glass windows of a cathedral, and spread itself over the people who knelt with outstretched hands...people wept and prayed with uncovered heads, in the presence of a miracle they had awaited. The seconds seemed like hours, so vivid were they." Depiction of the three children receiving the vision. This tilework is from Ironbound, a Portuguese neighborhood in Newark, New Jersey.No movement or other phenomenon of the sun was registered by scientists at the time.According to contemporary reports from poet Afonso Lopes Vieira and schoolteacher Delfina Lopes with her students and other witnesses in the town of Alburita, the solar phenomena were visible from up to forty kilometers away. "You have seen hell where the souls of poor sinners go. To save them, God wishes to establish in the world devotion to my Immaculate Heart. If what I say to you is done, many souls will be saved and there will be peace. The war is going to end: but if people do not cease offending God, a worse one will break out during the Pontificate of Pius XI. When you see a night illuminated by an unknown light, know that this is the great sign given you by God that he is about to punish the world for its crimes, by means of war, famine, and persecutions of the Church and of the Holy Father. To prevent this, I shall come to ask for the consecration of Russia to my Immaculate Heart, and the Communion of reparation on the First Saturdays. If my requests are heeded, Russia will be converted, and there will be peace; if not, she will spread her errors throughout the world, causing wars and persecutions of the Church. The good will be martyred; the Holy Father will have much to suffer; various nations will be annihilated. In the end, my Immaculate Heart will triumph. The Holy Father will consecrate Russia to me, and she shall be converted, and a period of peace will be granted to the world." Lúcia reported seeing the Virgin again in 1925 at the Dorothean convent at Pontevedra, Galicia (Spain). This time, she said she was asked to convey the message of the First Saturday Devotions. A subsequent vision of the Christ Child Himself reiterated this request, by her account. Lúcia was transferred to another convent in Tui or Tuy, Galicia in 1928. In 1929, Lúcia reported that Mary returned and repeated her request for the Consecration of Russia to her Immaculate Heart. Lúcia reportedly saw Mary in private visions periodically throughout her life. Most significant was the apparition in Rianxo, Galicia in 1931, in which Sister Lúcia said that Jesus visited her, taught her two prayers, and delivered a message to give to the hierarchy of the Church. In 1947, Sister Lúcia left the Dorothean order and joined the Carmelite order in a convent in Coimbra, Portugal. Lúcia died on February 13, 2005, at the age of 97. After her death, the Vatican, specifically Cardinal Joseph Ratzinger (at that time, still head of the Congregation for the Doctrine of the Faith) ordered her cell sealed off. It is believed this was because Sister Lúcia had continued to receive more revelations, and the evidence needed to be examined in the course of proceedings for Lúcia's canonization. Lúcia's cousins, the siblings Francisco (1908–1919) and Jacinta Marto (1910–1920), were both victims of the Great Spanish Flu Epidemic of 1919. Francisco and Jacinta were declared venerable by Pope John Paul II in a public ceremony at Fatima on May 13, 1989. John Paul returned there on May 13, 2000, to declare them 'blessed' (a title of veneration below that of sainthood). Jacinta is the youngest non-martyred child ever to be beatified. During the second apparition on June 13, 1917, the Virgin Mary predicted the deaths of two of the children, although Lúcia did not tell anybody about these predictions until 1941. Some accounts, including the testimony of Olímpia Marto (mother of the two younger children) state that her children did not keep this information secret and ecstatically predicted their own deaths many times to her and to curious pilgrims. According to the 1941 account, on June 13, Lúcia asked the Virgin if the three children would go to heaven when they died. She heard Mary reply, "Yes, I shall take Francisco and Jacinta soon, but you will remain a little longer, since Jesus wishes you to make me known and loved on earth. He wishes also for you to establish devotion in the world to my Immaculate Heart. Jacinta, in fact, accurately foretold the time and detailed circumstances of her death, according to Lúcia and hospital staff. Exhumed in 1935 and again in 1951, Jacinta's body was found incorrupt. Francisco's had decomposed. According to Sister Lúcia, The Virgin promised that the Consecration of Russia would lead to Russia's conversion and an era of peace. In 1952 the Pope reminded the Russian people, that the Virgin Mary was always victorious. "The gates of hell will never prevail, where she offers her protection. She is the good mother, the mother of all, and it has never been heard, that those who seek her protection, will not receive it. With this certainty, the Pope dedicates all people of Russia to the immaculate heart of the Virgin. She will help! Error and atheism will be overcome with her assistance and divine grace". Pope Pius XII and Pope John Paul II both had special relations to our Lady of Fátima. Pope Benedict XV began Pacelli's Church career, elevating him to archbishop in the Sistine Chapel on May 13, 1917, the very day, Our Lady of Fátima is believed to have first appeared to three shepherd children in Fátima. Pius XII, was layed to rest in the crypt of Saint Peter's Basilica on November 13, 1958, on the Feast of our Lady of Fátima. The Lady of Fátima is credited by many faithful and, as mentioned below, by the Pontiff himself, with saving the live of John Paul II during the assassination attempt in 1981 on Fátima day. Pope John Paul II again consecrated the entire world to the Virgin in 1984, without mentioning countries like Russia. Some believe that Lúcia Santos verified that this ceremony fulfilled the requests of the Virgin. However, in the Blue Army's Spanish magazine, Sol de Fatima, in the September 1985 issue, Sister Lúcia said that the ceremony did not fulfill the Virgin's request, as there was no specific mention of Russia, and "many bishops attached no importance to it". In 2001, Archbishop Tarcisio Bertone issued a statement, claiming that he had met with Sister Lúcia, who reportedly told him, "I have already said that the consecration desired by Our Lady was made in 1984, and has been accepted in Heaven." Sister Lúcia died on February 13 (same day as the apparitions), 2005, without making any public statement of her own to settle the issue. Our Lady of Fátima 2008 Conference in the former Soviet Union focused on a future accompanied by Mary. Orthodox Russians gathered in Minsk with Catholics of Belarus to celebrate the 150th anniversary of Mary's apparitions in Lourdes and to consider her role in their personal and national history. It was recalled that Our Lady told Bernadette Soubirous that she was the Immaculate Conception. To some faithful, this may be an indication that the prayers to the Lady of Fatima about Russia are effective. The Vatican withheld the third secret until June 26, 2000 – despite Lúcia's declaration that it could be released to the public after 1960. Several sources, including Canon Barthas and Cardinal Ottaviani, said that Sr. Lúcia insisted to them it must be released by 1960, saying, "by that time, it will be more clearly understood." When 1960 passed without any such announcement, immense speculation over the content of the secret materialized. Some sources claim that the third part of the secret revealed in the year 2000 was not the real secret, or at least not the full secret. This was long suspected because it was known that the third part of the Secret began with the words, "In Portugal, the dogma of the Faith will always be preserved etc." Sister Lúcia revealed this in her Fourth Memoir. These words and even this theme were not reflected by the version released by the Vatican on June 26, 2000. Another argument for this revolved around the decision to release the secret much later than when specified by Sister Lúcia. It was thought that the secret might contain condemnatory remarks about the last pope (who obviously would not have wanted to release it), or that it might contain inflammatory remarks about Russia. Instead, the third part of the secret as revealed was by far the most unspecific and ambiguous part (compared to earlier parts which said that if unconsecrated, "Russia will spread its errors around the world"). Cardinal Ratzinger (later Pope Benedict XVI) said in November 1984 that the Secret would cause "sensationalism" and dealt with the "end times." This comment could not be understood if the Secret referred to the assassination attempt in 1981. On November 11, 1984, as reported in the Pauline Catholic magazine Jesus, Cardinal Ratzinger stated that he had "read the text of the Third Secret." When asked why he had not revealed it, he replied that "in the judgment of previous Popes, it adds nothing to what Christians must know respecting what is stated in the Book of Revelation." This followed the report in the October 1981 issue of the German Catholic magazine Stimme des Glaubens of a discussion at Fulda in November 1980 when Pope John Paul II had stated to a select group of German Catholics, in response to the question why he had not revealed the Third Secret of Fatima, "If you read that the oceans will inundate continents, and millions of people will die suddenly in a few minutes, once this is known, then in reality it is not necessary to insist on the publication of this Secret." However, in another interview, Pope John Paul II indicated that the entire secret of Fatima could be summarized in the idea that prayer, especially the Rosary, is the remedy against all manner of evil. On November 15, 1966 Pope Paul VI revised the Code of Canon Law, striking down canons 1399 and 2318, which among other things had prohibited and penalized the publication of any material concerning any apparitions (approved or not) without beforehand obtaining a bishop’s imprimatur. After the revision, therefore, anyone in the Church was permitted to publish freely on Marian apparitions, including those at Fatima. Yet Sister Lúcia was still forbidden to reveal the Fatima Secret. She remained under an order of silence until her death in February 2005, unable to speak freely about Fatima without special permission from the Vatican. Some Roman Catholics recite prayers based on Our Lady of Fátima. One well known prayer is the Angel Prayer as an Act of Reparation to The Holy Trinity for insults and blasphemies against the Holy Trinity and the Blessed Sacrament. This prayer is attributed to an angel who appeared to the visionaries, and is hence called the Angel Prayer. Conservative Catholics take the anti-Communist character of Lúcia Santos' messages very much to heart. The Blue Army of Our Lady is made up of Catholics and non-Catholics who believe that by dedicating themselves to daily prayer (specifically, of the Rosary) they can help to achieve world peace and put an end to the error of communism. In 1952, a feature film, The Miracle of Our Lady of Fatima, was released. Critics held that the film overplayed the role of socialist and other leftist elements in Portuguese government as the "adversaries" of the visions. They state that since the government was controlled not by socialists but by Freemasons at the time, most government opposition to the visions would have been motivated by concern for separation of church and state, not by atheistic or Communistic ideology. Other critics have stated that only the enemies of the message propose such a belief. 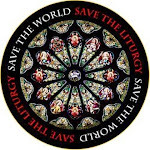 Private revelations do not form part of the deposit of faith of the Roman Catholic Church and its members are not bound to believe in any of them. However, as a matter of prudence, assent would normally be expected of a Catholic based on the discernment of the Church and its judgement that an apparition is worthy of belief.Popes Pius XII, John XXIII, Paul VI and John Paul II have voiced their acceptance of the supernatural origin of the Fátima events. Indeed, John Paul II credited Our Lady of Fátima with saving his life following the assassination attempt on the Feast of Our Lady of Fátima, 1981. After a canonical enquiry the visions of Fatima were officially declared "worthy of belief" in October 1930 by the Bishop of Leiria-Fátima.